Warlord Me is a fashion company located in Austin, Texas. The owner, Melania, created a brand for the millennial women. Her Company offers inspiration through unique, affordable clothing and accessories for the woman with a need to seamlessly transition from professional to playful. It was important that her logo embodied both fashion and the empowerment of women. Gunlock is an extension of the Moonshine Ridge brand. It was important to the owners that the label feel similarly to their flagship brand, but they wanted to introduce a fresh new look. Gunlock Vodka is made with pride in small batches and truly is handcrafted. We wanted the label to connect the past with the present to represent the seven-hundred-year-old tradition of distilling vodka. We used custom hand lettering to interact playfully with the description of the product and used woodcut illustrations to capture the nostalgia of the craftsmanship that goes into creating vodka in small batches. 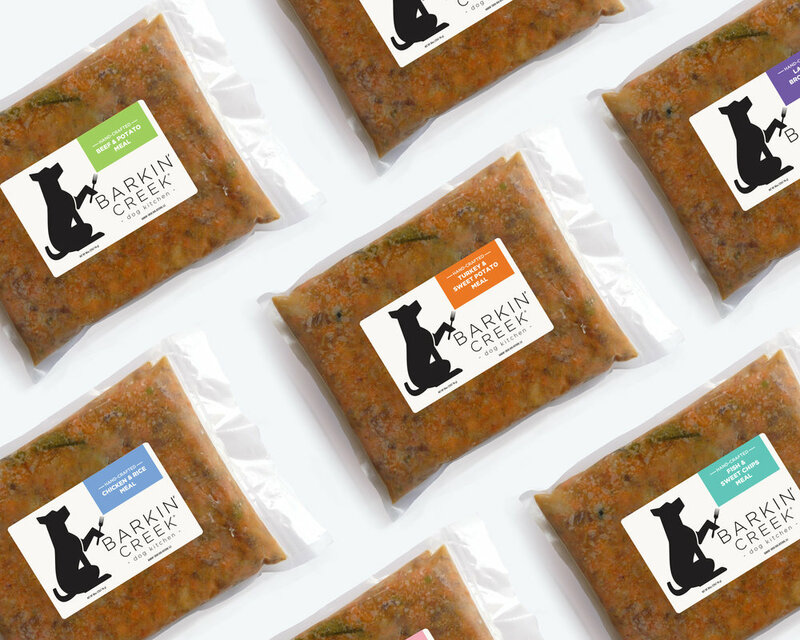 Barkin' Creek is a family-owned and operated dog kitchen and spa. They supply healthy meals and treats for your dog in Austin, Texas. Their dog food is as fresh as you can get for your favorite pup. We really let their food shine with clear packaging that shows off the product. We kept the label very chic by using clean typography and a fresh color palette. Dog Heart grooming is an upscale mobile grooming salon providing total care for your furry friend because unconditional love deserves unconditional care. Courtney first came to me when she needed help creating a brochure that would showcase everything she offers and trust me it is more than just a haircut! From the brochure, we moved to really establish her brand through rack cards, business cards, flyers, badges, and new contracts. Soon we will be launching her new website. Essence of Delilah is a soap company located in Austin, Texas. They pride themselves on using only the finest ingredients. Mark had been selling his soaps at local farmers markets for years when he approached us for an upgraded package design. Named in honor of his mother, it was important that the label captured a nurturing and fun spirit. The final label uses both pattern and color to help the product pop off the shelf. 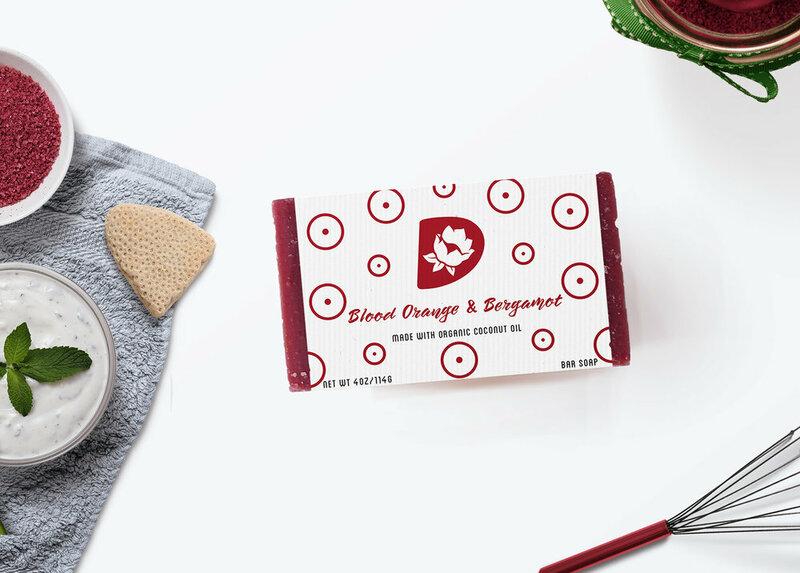 We chose the color palette from the hue of each soap, making the individual type of soap easily identifiable for the customer. By selecting a recycled natural paper, we were able to continue the organic feel of the product. Jason and Tom wanted to capture that old world feel on their product label and have it stand apart from their competitors. We went with a muted color palette but then used a copper color help the logo pop of the page. “ If your looking for a great graphic design company look no further, Emily at Spii Graphics is who and what you’re looking for. Emily designed our business cards, created our company logo and badge, also designed our labels for our moonshine bottles, and laid out the design for our web page. Black Velvet specializes in aged & ripened vintage cakes. Black Velvet cake is steeped in tradition going back generations, evoking "timeless memories of the European cake baking tradition". We used flourishes and color to capture the artisanal feel that their cakes evoke. Anja Kersten is a writer, performer, and filmmaker. The cover of this book was a redesign of one that she already had but just wasn’t working. She needed a cover that would better showcase her 12 story-delights. Her book is a quirky and fun read, full of imagination and refreshing stories and that is what I wanted to capture for the cover.